Derek Carr: Fantasy’s Most Overrated Quarterback? With the NFL Draft and free agency having come and gone, we’ll break down all sorts of fantasy-relevant questions entering the 2018 season. Up next is a look at how Oakland’s $125 million quarterback will perform with a new coach and new receivers. Since Carr entered the league in 2014, no starting quarterback has stayed off the ground better than him. However, he’s failed to efficiently lead the Raiders, both on the stat sheet and the scoreboard. In fairness to Carr, he hasn’t received much help. He’s thrown to a group of pass catchers that has combined to drop a league-high 156 balls since he entered the league. Amari Cooper and Michael Crabtree rank first and third, respectively, among all wide receivers in drops since 2015. Plenty of below-average quarterbacks can remain valuable fantasy assets thanks to a variety of factors — Carr just hasn’t been one of those quarterbacks for the better part of his career. Overall, Carr has finished last four seasons as fantasy’s QB19, QB11, QB15, and QB20. His average draft position on Fantasy Football Calculator at the time of this writing pits him as the QB13/18 in standard/PPR. 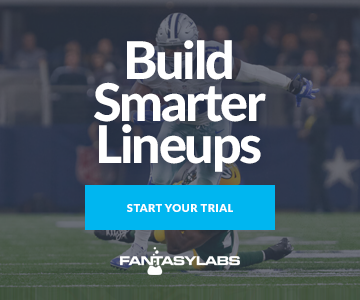 While Carr may have functioned as an above-average fantasy quarterback in 2015 and 2016, he doesn’t possess many of the traits of a fantasy-friendly quarterback; deep-throwing, mobile, and high-volume red-zone quarterbacks have historically been better DFS options than their counterparts. Has never scored a rushing touchdown in the NFL and hasn’t surpassed 150 rushing yards in a season since high school. Has never ranked in the top 20 in average depth of target. Has finished better than 18th in red-zone pass attempts just once in four seasons. Carr is a risk-averse and immobile quarterback who has seldom offered fantasy upside in his career. Not much should change with a new play caller. After doing so in four of six seasons with the Eagles and Raiders, new head coach Jon Gruden didn’t coach a single top-10 scoring offense from 2002 to 2008 with the Buccaneers. In fact, the Bucs never finished higher than 18th in scoring during the Gruden era. Naturally, this didn’t help produce any high-end fantasy quarterbacks. The last quarterback to finish a season as a top-10 fantasy option under Gruden was Rich Gannon (QB4) in 2001. It’s fair to say the Gruden’s crop of quarterbacks with the Bucs — Brad Johnson, Brian Griese, Chris Simms, Bruce Gradkowski, and Jeff Garcia — didn’t possess Carr’s talent, but it’s also tough to assume Gruden will raise the fantasy ceiling of Carr to a Gannon-esque level. There are some reasons for optimism. Gruden is expected to feature Cooper as the No. 1 receiver after the team chose to not resign Crabtree. Cooper is expected to be flanked by Martavis Bryant, with Jordy Nelson likely working out of the slot. Toss in the return of Jared Cook, plus the league’s third-most expensive offensive line, and it’s possible the 2018 edition of the Raiders will be the most talented supporting cast of Carr’s career. Still, it’s now or never for Carr’s fantasy stock, and based on the history of both him and his new coach, “never” might be the more likely outcome.